The 2013 Subaru WRX STI driven by David Higgins and Craig Drew blows away the competition for third straight victory at Oregon Trail Rally. What are they doing to dominate? When the Subaru Rally Team USA climbed aboard their recently upgraded 2013 Subaru WRX STI they felt confident that they could win their third straight victory at the 2013 Oregon Trail Rally. The Portland International Speedway was teeming with fans and as the racers prepared to get underway for the final day. Could the Subaru team hold off their main competition from Hoonigan Racing's Ken Block and Alex Gelsomino? Higgins and Drew were in good spirits as they climbed aboard their recently upgraded 2013 Subaru WRX STI. The race car had received a new Sadev 6 speed sequential transmission and an updated suspension for this race season. The car was prepared over the winter at Vermont SportsCar Rallying, and is also the home base for the Subaru Puma RallyCross team. The new refinements were expected to allow for even greater durability and improved performance of the WRX STI race car this season. Subaru keeps winning because they have a great team of drivers and also have the best equipment. The Japanese automaker has the perfect car for this kind of racing environment. Rallying is deeply rooted within their brand. The Subaru cars feature all-wheel-drive, they are tough and durable and this is ideal for the sport. 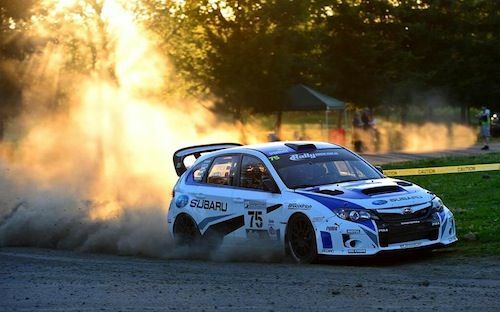 We see what happened this weekend as the Subaru team dominated the field again. After getting off to a great start Friday under beautiful sunny skies, Higgins described the new setup in one word as "efficient". It certainly proved to be just that - and fast. The #75 WRX STI took three of four stage wins and ended day one with a 38.4 second lead over Canadian rival Antoine L'Estage. However, as Craig Drew put it "The real rally starts tomorrow, but it's a good start." The Subaru team has a significant lead after two days of competition and Higgins and Drew entered the final day relaxed and confident. They were able to keep the pedal down just enough to keep up a good but without getting into trouble. The Subaru WRX STI pulled in for the victory and they finished with their third consecutive win at the Oregon Trail Rally. Ken Block and Alex Gelsomino take 2nd place, Rifat Sungkar and Marshall Clarke took third place. At the finish champagne celebration David Higgins offered some insight into their weekend. "We drove smart, at our own pace, and just avoided trouble. Once we amassed a big lead it afforded us the opportunity to really dial back the speed on Sunday and reduce the risks. We didn't win stages outright but knew it was the right strategy for victory. This is a very challenging event and I enjoy the big mix of character in the stages. This event has everything." The scene was spectacular with scenic vistas of Mount Hood in the distance and intense twisty and rocky sections in the tall Oregon forests. The 2013 Subaru WRX STI flew over the rough and dusty roads and wins their third straight victory on a perfect picture day with blue skies and sunshine. The next stop on the Rally America National Championship will be on the East Coast at the Susquehannock Trail Performance Rally (STPR) and takes place May 31-June 2 in Wellsboro, Pennsylvania.